Time waits for no one. None of us can ever know with certainty what our futures hold. The idea that you might one day lose your mental faculties and be unable to make choices is not pleasant, but ignoring it doesn’t make it go away. As a capable, rational adult, creating an incapacity plan that addresses this possibility is something you cannot, and should not, avoid. Without an incapacity plan, you make it harder for your family and loved ones should the unthinkable happen to you. Incapacity planning is a process through which capable adults make choices and plans about the future. Unlike retirement or estate planning, incapacity planning addresses not an eventuality, but a possibility. Namely, it addresses what you want to happen should you lose your ability to make choices, express your choices, or otherwise lose the decision-making skills you now enjoy. A basic incapacity plan addresses three key decision-making areas: financial, personal, and health. A good plan ensures that, should something happen to you, your wishes will be protected, as well as makes sure someone will have the legal authority to represent your interests. If you are like most people, you haven’t created an incapacity plan. Whatever the reason is for you not having a plan, you should have a general understanding of why these plans are so important, and why you need to make one as soon as possible. Here are the essential facts you need to know. Even the most basic incapacity plans can provide protections that you would otherwise forego. A good plan can save you and your loved ones from a variety of legal, financial, and personal problems. Every responsible adult should have at least a basic plan in place at all times. Living Will. A living will is a document that states what kind of health care you wish to receive, or refuse to receive, should you lose consciousness or capacity. A living will – a type of advance medical directive – only applies if you are alive but unable to make or communicate your wishes. Unlike a last will and testament, your living will has nothing to do with what happens to your property after you die. Do Not Resuscitate Order. Often included as a part of a living will, a Do Not Resuscitate order (DNR) can also be a separate document. This document states the conditions under which you refuse to accept resuscitative measures, such as cardiopulmonary respiration or CPR, that are performed after your heart stops beating or you stop breathing. Most people who choose to create a DNR are suffering from a terminal and incurable illness, or have a high risk of suffering serious complications that might arise from resuscitative measures. Health Care Power of Attorney. Another kind of advance medical directive, a health care power of attorney (also known as a health care surrogate, health care proxy, or by similar terminology), is a document that designates someone to have the legal right to make medical choices on your behalf if you cannot make them on your own. Health care powers of attorney, when paired with a detailed living will, ensure your health care wishes are protected should you lose capacity. They can be made to take effect immediately, or to take effect only after you lose capacity. HIPAA Release. A HIPAA release is a document that allows your physicians or health care providers to talk to your relatives, friends, or other people you select about otherwise confidential medical details. A HIPAA release is not the same as a health care power of attorney, as it does not name someone who will make choices for you. The release allows you to ensure that your family and loved ones can receive detailed information about your health and treatment when you are incapacitated, instead of being kept in the dark. Durable Power of Attorney for Finances. A durable power of attorney for finances allows you to choose someone who will have the legal authority to manage your financial affairs if and when you lose the ability to do so yourself. Like a health care power of attorney, the financial power of attorney can take effect immediately, or upon some later event, such as you losing capacity. Durable powers of attorney allow your chosen representative to, for example, use funds from your bank account to pay your bills when you are hospitalized or otherwise incapable. Revocable Living Trust. A revocable living trust is a common tool used in estate planning. It is primarily designed to allow property to pass from you to your inheritors without the property going through the probate process. But, you can also use your revocable living trust as an incapacity planning tool. When you create the trust you choose a trustee who will manage the property the trust owns. You typically serve as your own trustee, but, should you become incapacitated, you can also choose a successor trustee who will take over the trust management responsibilities when you’re not able to perform them. This ensures that the property the trust owns will be properly cared for should you lose capacity. Determining which tools you need to include in your plan, and what those pieces need to say, isn’t always easy to do on your own. To make sure your plan is created properly, it’s best to consult an experienced estate planning attorney. Your lawyer will guide you through the planning process and make sure that all the tools you create will be effective if and when they are needed. The cost of making an incapacity plan differs depending on a number of factors, such as your needs, your location, and what kind of tools you choose to make. Most people make incapacity planning tools when they create an estate plan, and though the costs vary widely, you can expect to pay $500 – $2,000 or more if you hire an attorney to craft your plan for you. If you create a plan without an attorney, you can significantly reduce, and potentially eliminate, the up-front costs. But the total cost of your incapacity plan includes more than the amount you pay to create it. To measure the total cost, you’ll also have to measure the costs involved in not having a plan. To do this, it’s easiest to look at an example and compare what would happen in each situation. Example 1: You’re involved in a car crash and do have an incapacity plan. A lot of young, healthy, and otherwise responsible people don’t feel the need to create an incapacity plan. While it’s true that most people have a low chance of losing capacity, the unthinkable can and does happen on a regular basis. Take, for example, the risk of death or injury from car crashes. The Centers for Disease Control and Prevention reports that after heart disease, cancer, and chronic respiratory disease, car crashes are the 4th leading cause of death. According to the Department of Transportation, motor vehicle crashes result in about 35,000 deaths and nearly 2.5 million injuries per year. You don’t have to be involved in a serious crash to have serious injuries, and any crash that leaves you hospitalized or incapacitated for any amount of time can have a significant effect on your life. Creating an incapacity plan does cost money, but the costs of not having a plan can be significant. So, let’s say you’re not married but are in a long-term relationship with a romantic partner. Your local estate planning attorney created a basic incapacity plan for you. The plan included powers of attorney that name your partner as your financial and health care representative, as well as a living will that states what you want to happen if you’re comatose, hospitalized, and unconscious. Creating the plan required a couple of meetings with the attorney, signing some documents, and cost about $1,500. After you’ve created the documents you keep them in a safe place your partner can access if needed, as well as leave copies with your attorney. A year later, you’re involved in a car crash that leaves you seriously injured. You have to be hospitalized and kept in a medically induced coma for several days. Because your incapacity plan names your partner as your legally appointed agent, your health care provider goes to your partner whenever there is anything to discuss about your care and treatment. Similarly, when your partner shows your bank your financial power of attorney, they have no problem allowing your partner to manage your finances and access your accounts. Further, because you made your wishes clear, your parents, siblings, and friends are in no doubt about your desires. They don’t fight over who gets to make choices and can even participate in the medical decision-making process because you gave your doctors permission to discuss confidential information with them. Though your plan makes it clear that it’s your partner’s final decision that matters, your family members and loved ones can all discuss the options together, and can all be a part of the decision-making process. Once you recover and regain capacity, you take up running your own affairs right where you left off. Your financial affairs have been protected, and your family and personal relationships are intact. Example 2: You’re in a car crash and don’t have an incapacity plan. Now, instead of being involved in an accident with a plan in place, let’s say that you don’t have a plan. You’re left in a coma, needing others to make choices for you and manage your affairs while you’re incapacitated, but you’ve left no legally enforceable directions or choices that others can rely upon. Here’s what can happen. An incapacity plan will not lower your health care costs or protect you from injuries, but not having a plan if you’re incapacitated will typically require some significant legal expenses. If you’re hospitalized and cannot communicate or make choices, your health care providers will still need to talk to someone about your health care options and decisions. For basic decisions your doctors will consult your closest family members, such as your spouse if you’re married, your parents or siblings if you’re single, or even your children if they are old enough. But, for more important decisions, your health care providers may require someone with the legal authority to make decisions on behalf of an incapacitated person. This means that one of your family members or loved ones will have to go to court and ask the court to name a guardian or legal representative. To do this, they’ll have to hire an attorney, go to court, and perhaps wait months before a court makes a decision that will allow them to manage your affairs or make choices for you. Hiring an attorney for this process can easily cost $5,000 or more. And because your family doesn’t have access to your funds, they’ll have to pay the money on their own until they have the legal authority to use your funds to pay for the legal expense. If your family needs to file for an emergency guardianship or conservatorship, the legal fees can be much higher. Besides the cost of health care, not working, and incurring damage to your vehicle, financial costs associated with not having an incapacity plan can come from unexpected sources. Let’s say you have several credit card bills that must be paid. Even if your partner knows you have bills that are due, she won’t be able to access your bank account to pay the bills because you’re not joint account holders. If your bills get paid late, or don’t get paid, this could lead to late fees or penalties. It could also negatively affect your credit score, leading to higher interest rates and fewer credit options. Similarly, failing to pay your rent, car payment, mortgage, cell phone bill, or any other obligation could lead to a range of negative consequences, ranging from car repossession to eviction and foreclosure. It’s important to note that even if you have an emergency fund in place to cover these kinds of expenses, you will not be able to access those funds. So, unless you’ve taken steps to give someone access to your accounts in the event you’re left incapable, your emergency fund is useless in this situation. Apart from the legal fees and financial costs of incapacitation, there’s also the potential damage to personal relationships that you need to consider. If you’re left incapacitated, your family members and loved ones will want what is best for you. They will want to do what you would have wanted. But what is that? How do they decide what you would want if you cannot talk? How do they decide who gets to make choices? What if they cannot agree? Let’s say you and your partner talked about your wishes prior to you being in the accident. You told your partner that you wanted him to make your choices should you fall ill. But, you didn’t create any document that protected your choices. So, when it comes time to make decisions for you while you are in a coma, your partner insists that he should be your representative. Unfortunately, the law does not recognize an unmarried romantic partner’s right to make choices for an incapacitated partner. Instead, that right will likely go to your closest relative, such as your parents or siblings. Even then, someone will have to go to court, ask the court to name a guardian or conservator, and only after receiving the legal authority to make your choices can your next of kin be your representative. And this doesn’t include the potential costs of a legal battle that could erupt if someone wants to challenge the representative’s wishes or choices. So, when you recover from your injuries, you may find that not only will your financial affairs be much worse off than they could have been, but the personal relationships between your family and loved ones may be irreparably damaged. Example 3: You’re in a car crash and have an incapacity plan that isn’t made properly. People who choose to go for the low-cost option when it comes to incapacity planning may not end up saving any money at all. The same problems that arise when you don’t have a plan can pop up when you have a plan that is incomplete, made incorrectly, or otherwise lacking. Furthermore, bad plans are typically the result of do-it-yourself planning, or creating a plan without the advice and guidance of a professional. While this can save you money up-front, it can also give you a false sense of security. Even though your plan may be missing pieces or be made incorrectly, you may assume that you are protected, and may be less likely to seek out professional advice or guidance. Once you lose capacity you lose the ability to change your plan, so you won’t be able to do anything about it. There are two possibilities when you become incapacitated: You have either already taken steps to protect yourself while you are incapacitated, or you have not. If you have not, the issues raised by your incapacitation must still be resolved, but since you are no longer able to resolve them yourself, someone else will have to do it for you. But who? If you don’t have a plan, there may be no clear answer about who makes your decision for you. In most situations, someone will have to go to court, ask the court to appoint a legal representative, such as a guardian or conservator, and wait for the court’s decision before they can act on your behalf. This all takes time and money, and usually costs much more to deal with after incapacitation than before. If on the other hand, you have an incapacity plan in place, you’ve already made it clear what your desires are and who you want to represent you. If you lose capacity with a plan in place, your chosen representatives can begin protecting you as soon as you lose the ability to represent yourself. Those representatives will also be able to rely on the guidance and choices you’ve already made through your plan. One of the most common fears that stop people from creating an incapacity plan is the idea that others will take advantage of them when they’re incapable. This is understandable. After all, if you’re not able to protect yourself, relying on someone else to do so seems fraught with danger. Unscrupulous representatives can abuse any power you give them, and use their position to harm your interests. Fortunately, there are several reasons why creating an incapacity plan gives you protections against this type of exploitation. First, when you create an incapacity plan, you get to decide what decision-making rights you pass to others. If you are concerned that giving too much authority to a single person is too much risk for you, for example, you can divide the authority between multiple people. You can also choose to name co-representatives that have equal authority to make decisions for you, but who can only do so if the other representative(s) agree. Second, you have the ability to choose trustworthy people to act as your representatives. If you don’t have anyone you can rely on you can hire a professional, such as an attorney, a bank or trust company, or someone else who routinely represents the interests of others. Appointing a professional will be more expensive than hiring a family member or friend, but the additional cost is preferable to selecting someone you cannot trust. Third, any representative who accepts your appointment becomes legally responsible to you. Your representatives have an obligation to act in your best interests, and not to use their power to take advantage of you or harm you. If they violate that duty, they can face civil and criminal penalties. When you create an incapacity plan, you’ll likely create one or more powers of attorney. A power of attorney is a kind of legal document that allows an adult to transfer, or delegate, decision-making abilities to someone else. Though the term “power of attorney” leads many people to assume that these documents require you to hire a lawyer, or otherwise involve a lawyer in some way, this is not the case. If you, a capable adult, choose to create a power of attorney, you become known as a principal. The person or organization you select as your representative is called an agent or an attorney-in-fact. The term “attorney-in-fact” is merely a title given to your legally designated representative. It in no way confers upon your representative the ability to act as a lawyer, nor does it require that person to be a lawyer. When you choose an attorney-in-fact, you have to choose a willing and capable adult. However, because powers of attorney are legal documents, it’s always a good idea to get a lawyer to help you create them. Other than that, powers of attorney and attorneys-in-fact do not involve lawyers. The incapacity plan you create when you graduate college will probably be different than the one you create after you get married, have a child, or learn that you have a chronic illness. Like other financial and estate planning tools, incapacity plans need to change and adapt to you over time. Moving to a New State. Because each state has its own laws about incapacity planning, you’ll want to at least review your plan should you move to a new state. Making an appointment to talk to a local estate planning attorney to talk about what you need to change is always a good idea following a move. Change in Relationship Status. If you get married, go through a divorce, or enter into a romantic relationship outside of marriage, you’ll want to make sure your incapacity plan reflects that. For example, let’s say you get divorced and enter into a romantic relationship with a new partner. Your old plan likely includes your former spouse as part of your plan. Whether you want to name another family member or your new partner as your representative, you’ll need to change your plan. Having a Child. Having a child changes you, often in ways you cannot expect. When you consider your child’s future, you must consider the possibility that you will not be there to be a caregiver, provider, or parent. Your incapacity plan needs to address what you want to happen if you lose your ability to raise or care for your child. Choosing and naming a temporary guardian, ensuring someone has the ability to use your funds to pay for child care needs, and ensuring your child is cared for and educated in a way that you approve will require some careful planning. Starting a Business. A business has its own set of demands, and if you’re the person in charge, your business will suffer if you lose capacity. Business owners need to develop incapacity planning tools that not only protect their interests, but also the interests of the business. You’ll need to be prepared to transfer your duties to someone who can manage them responsibly. Becoming Injured or Ill. Anytime you suffer a significant injury or learn you have a serious illness you’ll want to review your incapacity plan to make sure it accurately reflects your health care needs. For example, if you’re diagnosed with Alzheimer’s Disease or dementia you’ll need to be sure that your powers of attorney name a health care surrogate of whom you are confident can manage your affairs as your cognitive abilities degrade. You may also want to make different choices about what kind of health care you wish to accept or refuse, especially if you have a terminal illness. Time and Aging. As you get older, your medical and personal circumstances can change without warning. Many age-related changes are inconsequential, but if it’s been several years since you last updated your incapacity plan, you need to go back and look things over. Also, because laws can change, you will want to make it a point to contact your estate planning attorney once a year or so to ask about any changes you might need to know about. (Your attorney may automatically send you notices if any legal changes take place, but it’s a good idea to contact them to make sure.) If you have documents that are currently in effect, such as financial powers of attorney, you may need to update or renew them every three to six months to make sure that third-parties won’t have any questions about their validity and currentness. Anytime You Change Your Mind. If you’re going to create an incapacity plan, you need to be sure your plan reflects your needs, desires, and choices. If, for example, you feel more comfortable naming your sibling as your medical representative over your spouse, you should have a plan that reflects this desire. Similarly, if you ever change your mind, you need to change your plan. Incapacity planning isn’t pleasant. It’s not fun to contemplate your mortality or potential incapacitation. But it is something you need to do. Creating an incapacity plan is part of being a responsible adult. If you don’t have a plan, you need to create one as soon as possible. Making a plan will give you the opportunity to think about what is most important to you and your life, and how you can best protect not only yourself, but those closest to you. 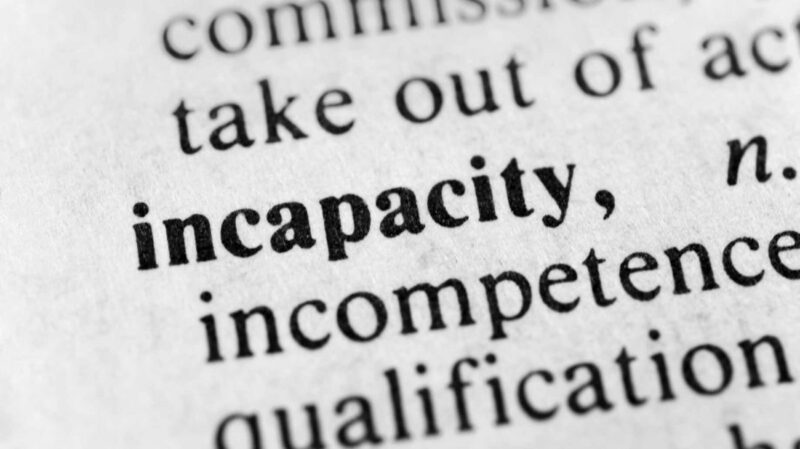 Do you have an incapacity plan? Why or why not?